Social and shy, deer have a rigid social structure that determines territory and breeding rights as well as ensuring their safety. A doe's social status can determine her responsibilities within a herd, while a dominant buck may have first rights to territory and breeding. Establishing a social hierarchy is an important survival mechanism for deer living in the wild. Deer are social animals, and females travel together in herds. Each social group is led by a matriarchal female, according to the website Mississippi Sportsman. This alpha doe is in charge of the herd, and warns the others when danger is approaching by snorting loudly or stamping her front hoof. She teaches young deer necessary survival skills, where to find water and food and where to seek cover. She is also responsible for driving young bucks from the herd once they have reached 1 year of age. When the herd is scattered by a predator, herd members can follow the scent of the alpha doe to a safer location. Young male deer will sometimes seek out the company of others, according to the website Deer Worlds. Forming a group affords these young and relatively inexperienced bucks a better chance to find food and shelter. These alliances last only as long as it takes for the bucks to reach maturity, however. Once the urge to reproduce has surfaced, a buck becomes territorial and will not abide the presence of another male. 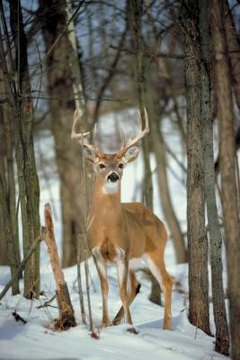 Fighting among bucks can establish the dominance of one animal over another, and determine territory or breeding rights. Deer communicate by using body language and limited vocalizations. A deer's head position may indicate his social status among his kind, or his willingness to establish himself as dominant. Both male and female deer avoid making eye contact with more dominant herd members, and avoid making physical contact with them as well. A high head posture indicates a deer that is ready to rear and fight with another, while a lowered head indicates a deer prepared to chase a rival or subordinate, according to Outdoor Alabama. Vocalizations may be characterized as grunts, bleats or snorts. Fawns bleat to indicate hunger. A doe may grunt to her fawn to keep it close, while a buck in pursuit of a female may grunt to warn off other interested parties. Deer in distress may utter a unique high-pitched bawl. A deer may stomp a fore hoof to indicate danger to others of its kind. A social pecking order is crucial to the survival of the herd. It is usually the eldest, most experienced doe who leads a herd, and the most seasoned buck who has first access to territory and available does. Though bucks do not stay with a herd except during breeding season, they too have a hierarchy. Should two equally dominant animals meet, they may fight to determine which will be subservient to the other. Fighting may include boxing with the front feet, kicking or charging one another, according to the Deer Initiative. What Noises Do Cattle Make? How Do Grizzly Bears Communicate? How Do Donkeys Show Dominance?